Enjoy the Great Outdoors Reclined Now! Fed up with trying to find trees the perfect distance apart? Want heavy duty adjustable camping gear hammock hanging straps that can hold you and your friends in a hammock? Had enough of those short hammock straps that take up too much space & always stretch leaving you on the ground? FREE Drawstring Bag to tie to camping backpack & to protect from the elements! 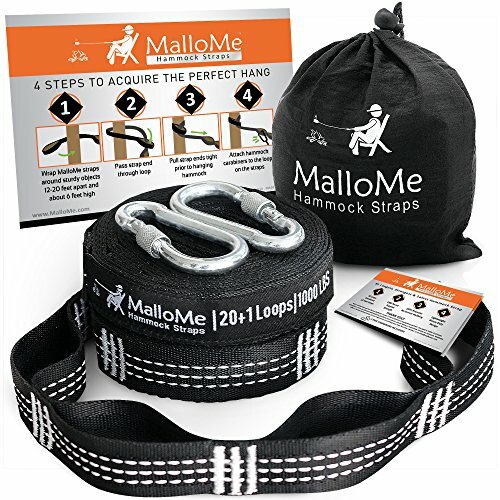 THOUSANDS of Amazon Buyers Trust MalloMe to Provide the Highest Quality. 100% SATISFACTION GUARANTEED. BUY NOW WHILE SUPPLIES LAST. CLICK ADD TO CART. The perfect gifts, so feel free to BUY EXTRA for your family & friends. ADJUSTABLE & NO-STRETCHING FOR COMFORT: Our daisy-chained loop system makes it easy to adjust the height of your hammock fast so that your hang is amazingly comfortable every time even around grand trunk trees. And with our high quality 100% polyester webbing material, where your hammock hangs is were it stays. No stretching and ending up on the ground after a while, even when wet. View More In Hammock Accessories.